Every year Wadars Volunteer Community Ambassadors give talks about the work of Wadars to a wide range of local community groups and associations. We do ask for a suggested donation of £30-40 for our talks and the money raised helps to fund our work with both wildlife and companion animals. If you belong to a group and would like to find out more about requesting a talk, then please email enquiries@wadars.co.uk or call us on 01903 247111. 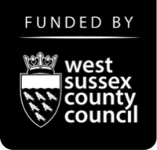 The presentation equipment used in these talks has been purchased as a result of a grant from the West Sussex County Council Small Grants Fund.